52% of buyers said the kitchen had the most significant impact on their purchasing decision - effective staging will address this! In today’s Mississauga real estate market the staging of homes prior to going on the market is quickly becoming a hot button. If you are considering selling your home here are some facts that may be helpful in determining whether to “stage” or “not stage”! 58% of buyers made a decision to buy after seeing 10 properties—effective staging keeps your house on the list of must-see properties. 54% of sellers are willing to spend more than $2000 to get their house ready for sale and of those, 25% were willing to pay over $5000—working with the right staging consultant maximizes your return on investment. 63% of buyers were willing to pay more money for a house that is move-in ready. 86% of those surveyed said storage space is important to potential buyers—effective staging maximizes space and spaciousness. Top three interior features for selling were freshly painted walls, organized storage space and current flooring—effective staging will address all three. 52% of buyers said the kitchen had the most significant impact on their purchasing decision. 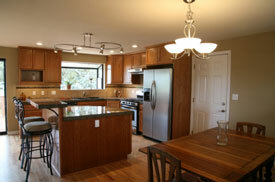 79% of buyers indicated they would be willing to pay a premium for a home with an updated kitchen. Men (41%) are more likely to place a premium on updated décor than women (30%). 77% of people view homes first on the Internet. 75% of buyers who searched on the Internet went on to view or drive by the homes. 40% of paint sold is as a result of incorrect color choice—CSPTM have Staging Safe ColourTM palette specifically chosen for successful staging. When deciding to view a house, 78% of objective elements are generally pre-determined before viewing: they are location and size—both things are outside of a seller’s control. Elements that create 72% of the first impression inside the home are within the control of the seller—well-trained staging consultants know how to show these to their best advantage. Moderately priced home improvements, ranging from $80–$2800, made in preparation for sale, yielded the highest returns when a house was sold. 87% of people said that home presentation makes a difference in most sales. So if you’re looking to sell your home in Mississauga, Etobicoke or West Toronto area definitely consider home staging as part of your selling strategy and don’t hesitate to contact the top Mississauga Realtor Cynthia Shaw. Be sure to visit my website for more information about the factors the influence the sale price of a home.